Food, mood and improvement in gut motility? Low FODMAP, wheat free, dairy free, egg free. So it begins, the Low FODMAP adventure – a tale of gut calming peace. Ready for the story? It began by eating out, but now I am happy to be home, then I can choose myself what to cook for my hubby and myself. Yesterday the weather had been appalling, back in the Pennines again and guess what? It’s raining again, not the raging downpours that happened over the summer, but a depressing drizzle – the drenching sort with no passion, it is so fine it may as well not be happening. But obviously it is, as my returning husband can contest, after going for a run he was soaked to the skin. Food and mood, now that’s interesting – shall we cook something to lift it? (Your mood that is!) Serotonin is a happiness chemical, it is made from tryptophan (an amino acid – building blocks of protein,) by your body and this chemical can lift your mood. It is also suggested that serotonin in the large intestine can help with constipation by increasing the speed the gut moves – some people with IBS-C are deficient, apparently. This seems to be one of the reasons why a low dose of antidepressants can be beneficial for IBS, it increases the amount of serotonin in the gut, thus increasing motility. Can this be done with food, I wonder? Food is better than taking pills, but we don’t have any evidence that food high in tryptophan can increase the levels of serotonin or improve a slow digestive system, so no point in taking this amino acid or foods high in tryptophan to try, until we do. See your doctor if you want to try a drug to help. It’s an interesting hypothesis though – don’t you think? I wonder if anyone will consider trialling it? Place the rice in a pan and cover with water, add a small pinch of salt, bring to the boil and cook till soft – this will take at least 40 minutes, watch the pan to ensure it doesn’t boil dry – boil a kettle and add more hot water to the pan if needed. Wash and prepare the mackerel and grill for 10 minutes on both sides till cooked. Put both the pine nuts and chopped hazelnuts on a tray and put in an oven to toast, watch this closely as it can easily burn. Chop mint and squeeze lemon. Add Lemon, mint and nuts to the rice and mix well. Place the celery in a dish and spray with oil and cook in the oven for 15 minutes until cooked. 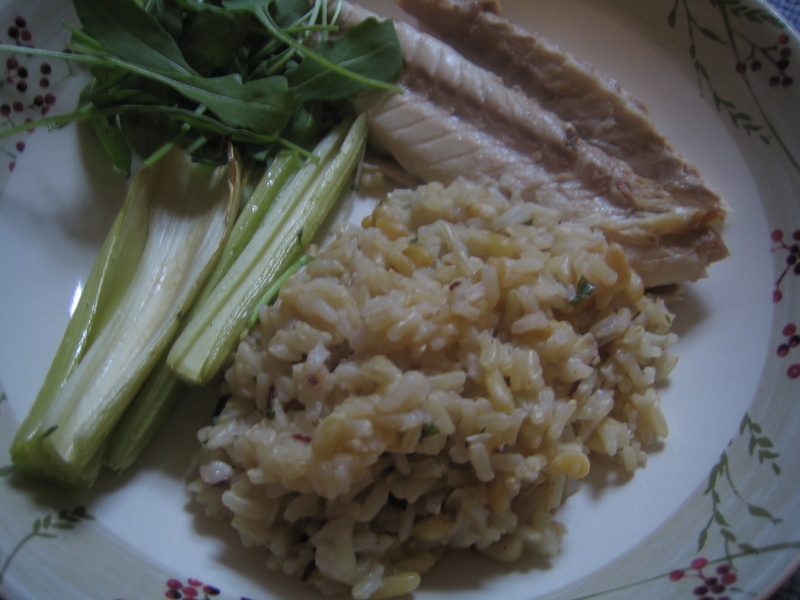 Brown rice contains B vitamins, omega-3 oil is in the mackerel and both contain tryptophan – all nutrients suggested to improve your mood, but the main thing here is that this meal is low in FODMAPs, tasty and hot – what other reasons do you need to tuck in? Next Post Midweek Low FODMAP special veggie chilli – A warming meal for chilly nights!